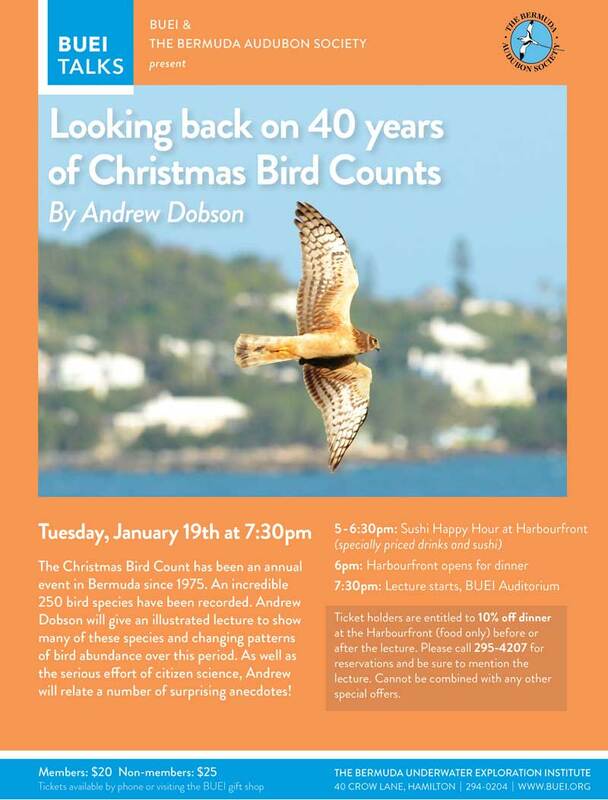 The Bermuda Underwater Exploration Institute [BUEI] and the Bermuda Audubon Society will present an entry in the BUEI Talks series titled “Looking Back on 40 Years of Christmas Bird Counts” by Andrew Dobson. The event will take place on Tuesday, January 19, beginning at 7.30pm. The event poster says, “The Christmas Bird Count has been an annual event in Bermuda since 1975. An incredible 250 bird species have been recorded. Andrew Dobson will give an illustrated lecture to show many of these species and changing patterns of bird abundance over this period. The presentation will talk place on Tuesday, January 19, with a Sushi Happy Hour to be held at Harbourfront from 5.00pm to 6.30pm and dinner opening at 6.00pm.